This page documents the final assembly of the cabinet. 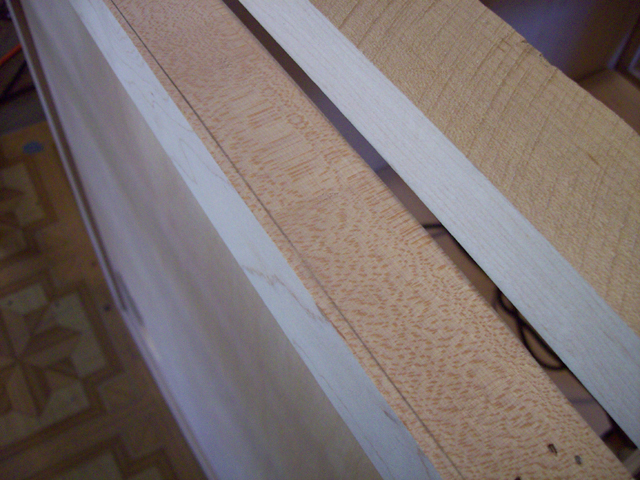 This is the final phase of building the cabinet. 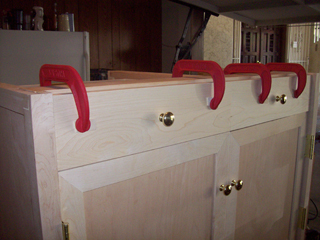 It has taken a year to get to this point, mainly due to time constraints and the fact that cabinetry is not my main profession or my only hobby, but I feel it is well worth the effort as I have learned a lot and have constructed exactly what I wanted. 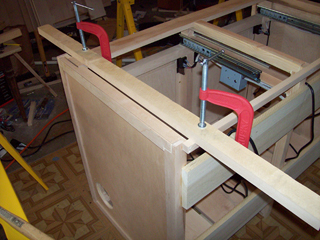 Installing the fronts for the drawers. 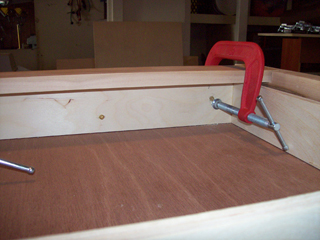 Glued and screwed. Front view of the drawer fronts as they are installed. 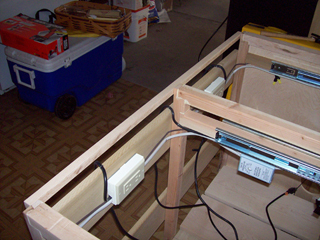 Additional support added to the back to help while mounting the top and to assist while mounting the saw guide. A saw guide was added to the cabinet base to help cut the side to fit the top. 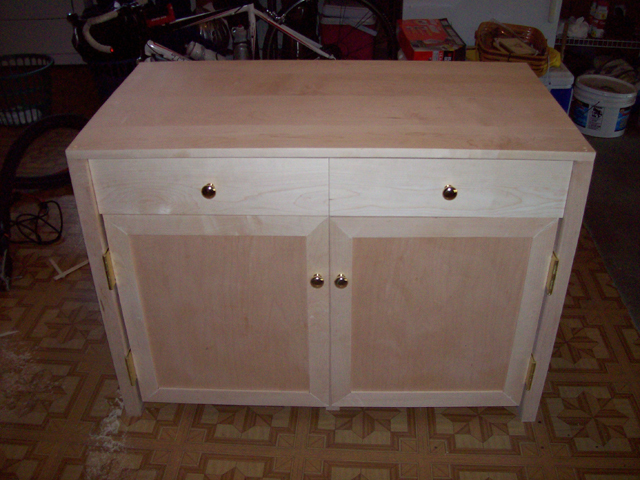 The cabinet was built slightly out of square. 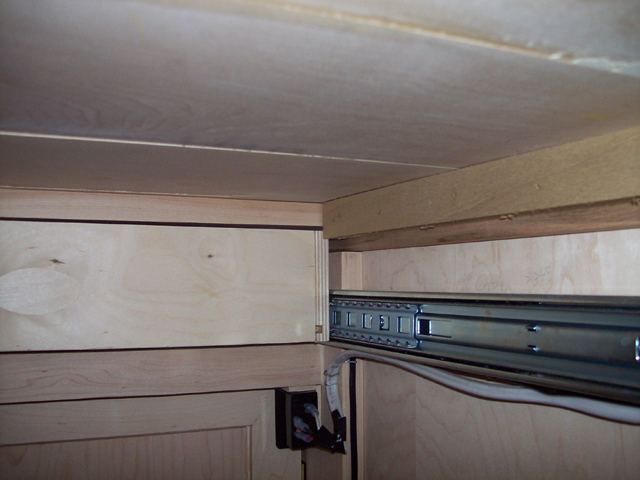 View of the line showing how out of square the cabinet was in relation to the top. 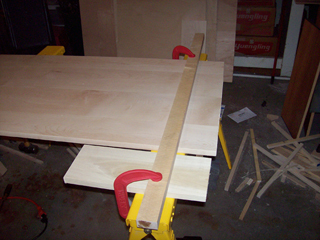 A circular saw was used to make the correction, sort of. A saw guide was added to the top to help cut it to fit the base. The cabinet was built slightly out of square. 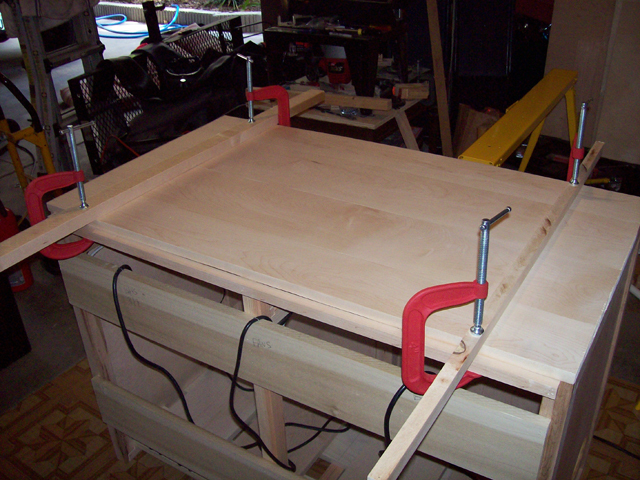 The top was still not completely flat, so bracing help was used while mounting. Worked well. 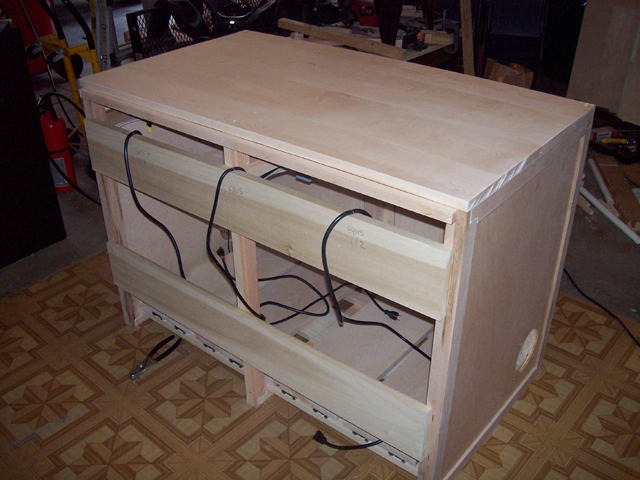 Rear view of the top after mounting to the cabinet base. Front view of the top after mounting on the cabinet base. 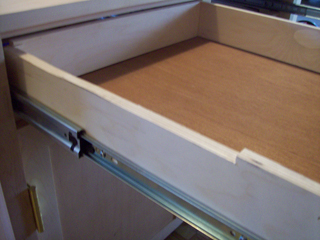 After mounting the top, I found that the braces added to the top to flatten it and used to mount it interfered with the drawers. View of the drawer/brace conjunction problem. 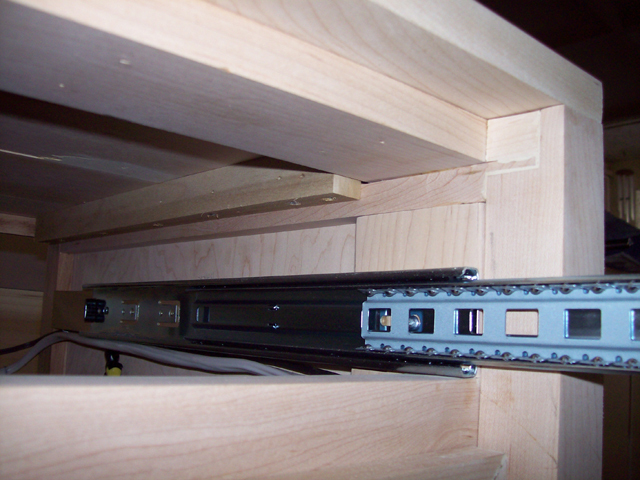 The solution to the problem was a 1/4 inch notch in the drawer edge. 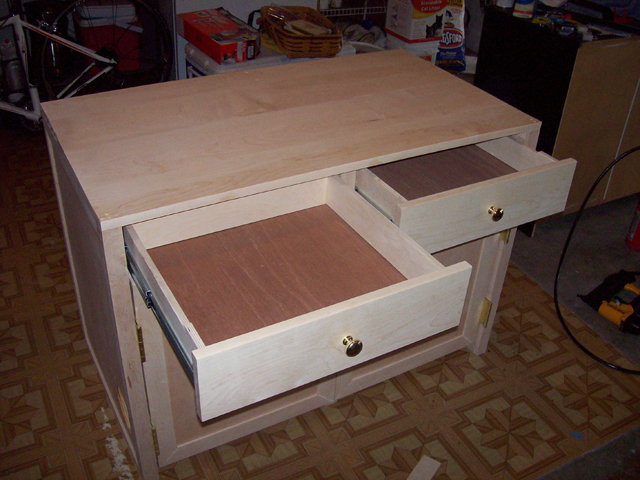 A view of the assembled cabinet showing the modifications to the drawers. 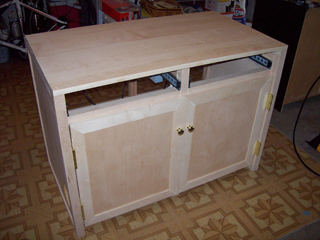 View of the cabinet as finally assembled.